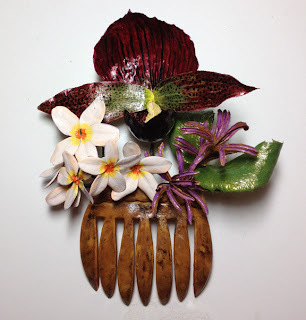 Again, I have created a botanical jewelry entry for The Philadelphia International Flower Show- March 4-11, 2012. This year's theme is Hawaii- Islands of Aloha. My entry is in the Artistic Jewelry Class titled 'Lanai Gathering- A Hair Ornament'. 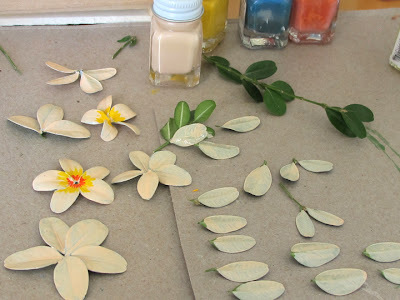 The entry must be made from plant material only such as seed pods, leaves, flower petals and nuts. Although the piece can actually be quite fragile, it must appear to be functional in scale and design. The first thing I do is research photos and the topic. Lanai is one of eight Hawaiian islands where tropical flowers and lush green foliage grow in abundance. Hawaii is orchids, plumeria and exotic blooms. 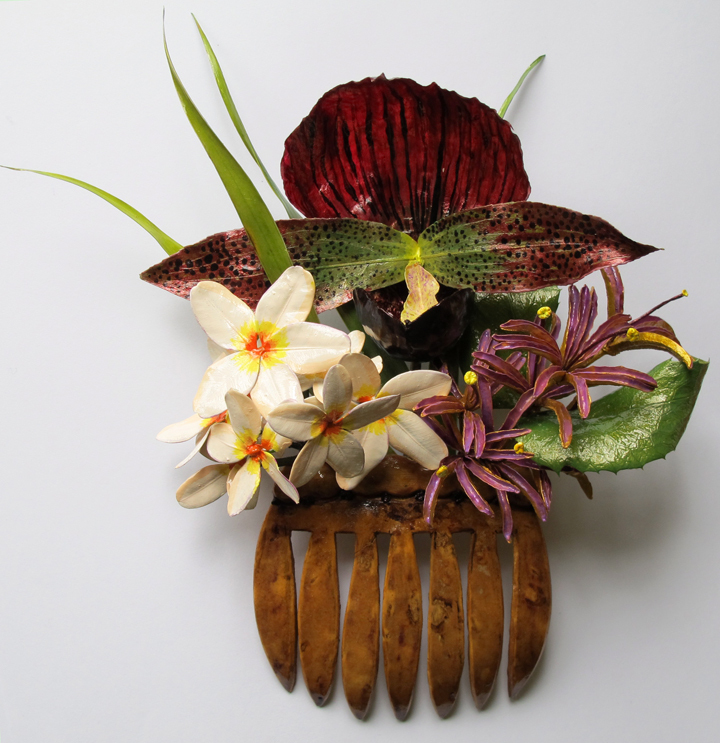 I decided my Hair Ornament would be a comb with fresh flowers. 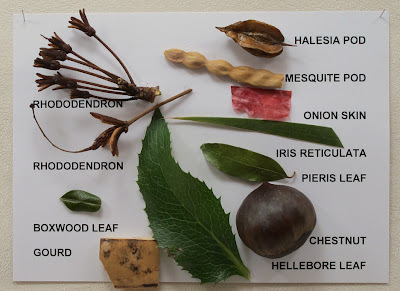 The next step is to find dry plant materials of various shapes and texture. Boxwood leaves as Plumeria. Favre. 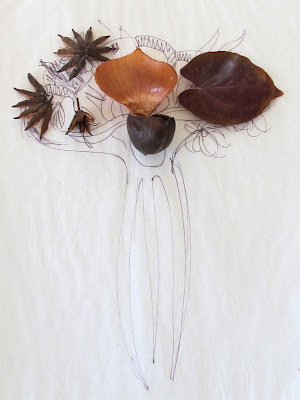 Dried Rhododendron pods- painted as flowers. Favre. 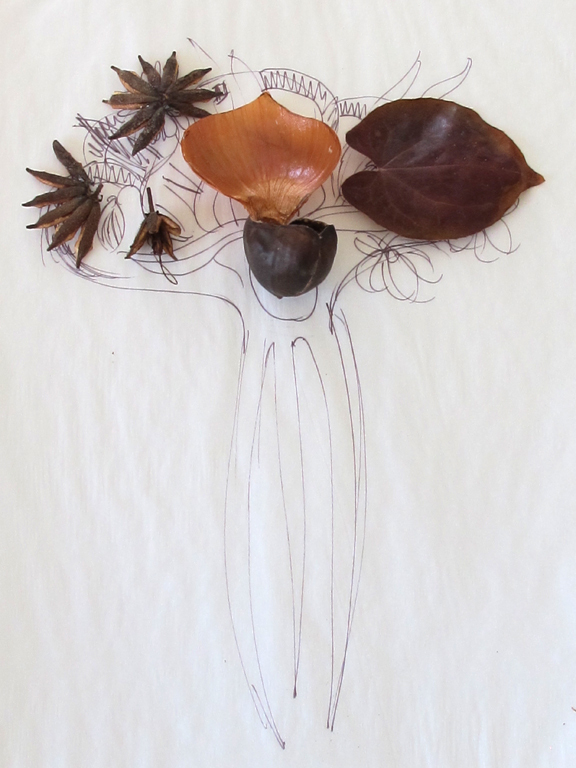 Chestnut and Onion skin Orchid. Favre. 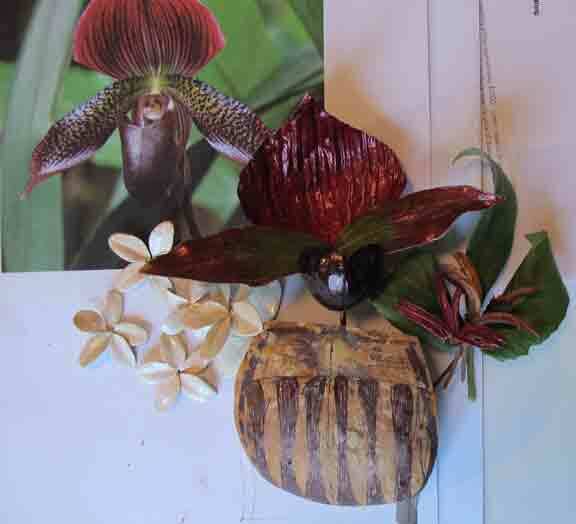 A Chestnut with red onion skin and pieris leaves makes a perfect paphiopedilum orchid! 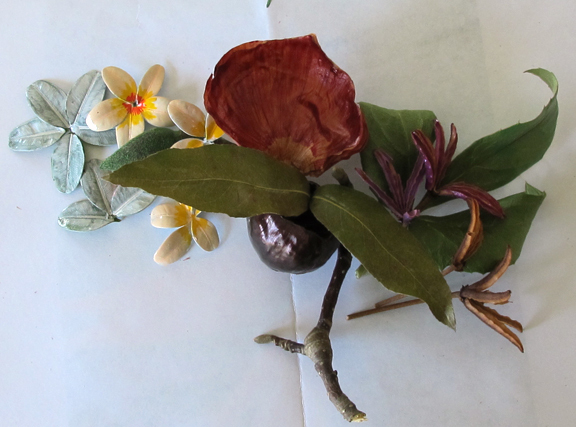 Boxwood leaves become a plumeria flower. 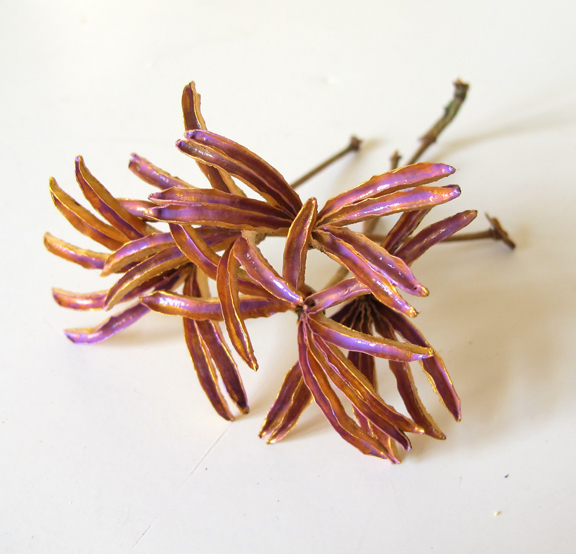 Dried Rhododendron pods split open to become an exotic bloom. The piece is slowly coming together. A dried gourd has the perfect contour and material strength to be the comb. After cutting the rough outline I drew a pattern to be cut away. I also modified the comb design from my original sketch. 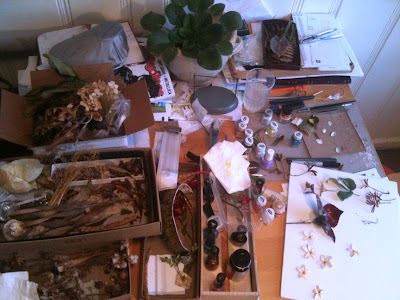 In the background is a photo of an orchid that I used for reference. Worktable. Pods, paint, nailpolish, etc. Almost finished but lacking in fullness. Using my iPad app, Brushes, I drew over a photo of the piece in effort to visualize what I could add to make the piece stronger. More lavender flowers, more white Plumeria, and more 'green'. Also, need to bring more orange or yellow into the design. 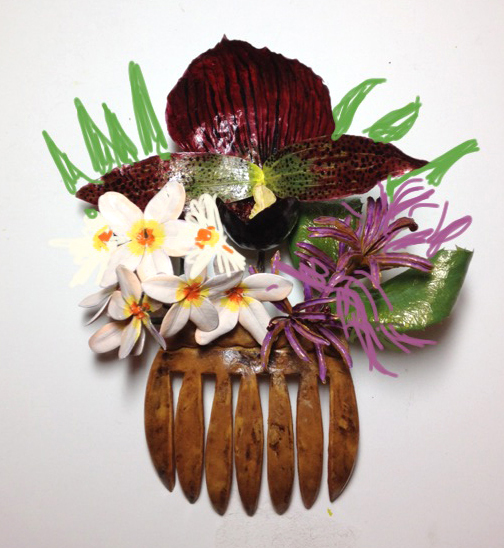 I used spray shellac on the gourd comb--I think it suggest tortoise shell which has a native Hawaiian look. I am always on the look out for dried material to collect. 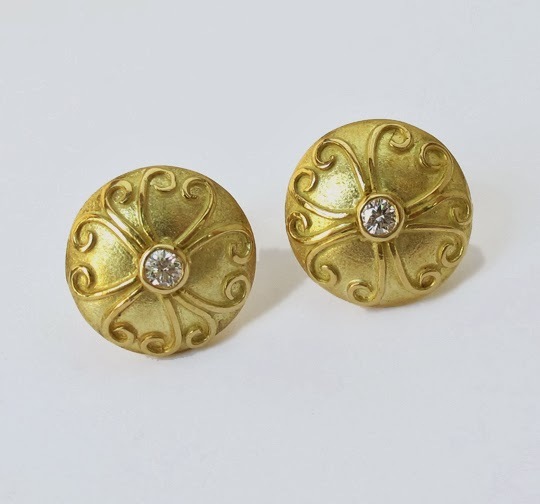 Often these little treasures inspire jewelry designs. The Mesquite pod came from the grounds of the Tucson Convention Center during the AGTA Gemfair 2011! The finished Hair Ornament for a Lanai Gathering. I found Barbaraanne's Hair Comb Blog which is a very useful resource if you want to go deeper into the subject of Hair Ornaments. You might like my latest post. Thank you for liking my blog.